What's crunchy, full of protein and more sustainable to farm than chickens? Crickets, of course! Tucking into a big bowl of these chirping grasshopper-relatives might sound like an episode of Fear Factor, but researchers from the University of Copenhagen say that cricket farming could be a nutritious solution to lowering the environmental impacts of food production. "Insects, in many cases, can be comparable to meat and fish in terms of nutritional value," says the study's lead author, PhD student Afton Halloran of the University of Copenhagen's Department of Nutrition, Exercise and Sports. "The fact that we have shown here that they can be produced more environmentally sustainably than meat means that they represent a massive potential for lowering the impact of the food production." So if crickets really are just as nutritious as meat and fish and better for the environment, why isn't the Western world eating them? 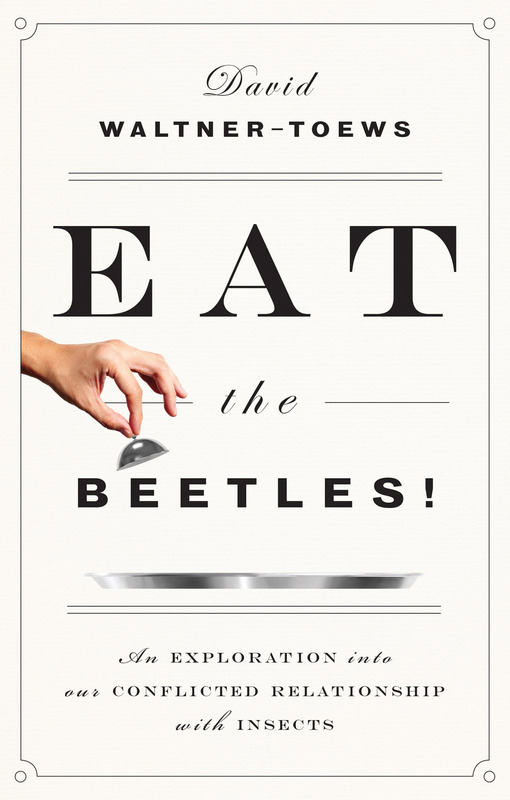 Canadian author, epidemiologist and veterinarian David Waltner-Toews tries to answer this question in his latest book, Eat the Beetles! : An Exploration into Our Conflicted Relationship with Insects. In the excerpt below, Waltner-Toews explores why we can't seem to get past the ick-factor. How do we begin to make sense of these conflicting cultural images [we have of insects] and the scientific and cultural entanglements from which they have emerged? How do we emotionally and intellectually create a mash-up of Alien and Antz, malaria and edible beetles, river blindness, black flies, and clean water? How can we begin to cope with our emotional ambivalence about digging into a bowl of live termites, or outright revulsion at watching Star Trek’s Klingons dip into a writhing bowl of Gagh? A first step would be to recognize the biases in our own narratives and not just the flaws in others. Despite the brilliant and Herculean efforts of that great Swedish naturalist and polymath Carl Linnaeus to standardize our descriptions of living things, even the most hard-core of hard scientists still fall back on culturally based metaphors and stories, if not to describe the things themselves, then at least to talk about their roles in nature. These metaphors and stories influence how we think about living things and, in turn, whether we wish to eat them or not. Do assassin bugs, as the name implies, kill important leaders for political or religious reasons? Or are they merely insects that kill and eat other insects? Is the large female insect — the one who carries the eggs and determines the genetic makeup of the beehive or ant colony — a queen? Surely not one that Elizabeth of England or even Lewis Carroll’s Red Queen would recognize as such. Similarly, the use of the terms workers and soldiers for ants, termites, and bees reflects political and social histories in England and India. Bert Hölldobler and Edward O. Wilson, in their book The Superorganism: The Beauty, Elegance and Strangeness of Insect Societies, write that decision-making in a beehive “is a highly-distributed process of friendly competition among the scout bees that identifies the best site. It is, in effect, a democracy.” Ah, so now we know. But is it a parliamentary democracy, with a queen? Or the republican form more familiar to those American authors? For those who are promoting entomophagy, the cultural baggage carried by insect names are more than curiosities for cultural critics and anthropologists. They create some quandaries. Bees are excellent protein sources if eaten directly — as good as or better than crickets and mealworms. Yet while Westerners may be quick to adopt crickets and mealworms, and harbor no moral qualms about eating hornets and wasps, they may balk at a curry in which baby honey bees are the main ingredient. Is it because we secretly believe in bee bodhisattvas, or extol the virtuous lessons of governance and democratic socialism the hive offers? Do not ants, termites, and hornets offer similar lessons? Is it because bees seem “cuddlier,” more like pandas than grizzlies? Or is it because bees are now deemed a critical component in industrialized monocultures? It is, I am guessing, a complex, confusing mix of these things. It is one thing to raise up and magnify positive images of insects in science and culture. The great challenge for those wishing to invent a sustainable food supply that includes insects will be to find ways to acknowledge the bad along with the good, and to dance cleverly with the tensions that emerge. Indeed, unadulterated cute and good stories about insects might dis-courage entomophagy as much as those that characterize them as unrepentant and evil marauders. An updated version might have the townspeople feasting on the sandwich themselves, but feeding the birds seems less selfish and more ecologically appropriate. In any case, the key to Itching Down’s solution to the wasp problem is that it targets only the ones that are pestering the town and uses natural animal behaviors to get rid of the pests. No nerve-gas weapons of war involved. In 2012, Doug Currie, Vice-President, Department of Natural History and Senior Curator of Entomology at Toronto’s Royal Ontario Museum, launched Black Fly Day as an antidote to the toxic commercialism of the day. The Giant Jam Sandwich got me thinking about how we might celebrate Black Fly Day. I see it as a general celebration of insects, a day to give thanks for the pure water that black flies alert us to, for the crickety biscuits in the oven, and for the awesome and awful locusts in the wild. What if we had a grand celebratory feast and invited Aboriginal Australians, indigenous people from Africa and Amazonia, China and Southeast Asia, as well as farmers from Ontario, Saskatchewan, and Nebraska? What if we asked each of them to prepare a meal that included insects or insect products, or products that depended on insects, for instance, for pollination? What if we explored the dark side of bugs, the crop pests and the malaria mosquitoes, even as we ate crickets or mopane worms or palm weevil larvae, pollinated nuts, cereals and fruits, bread with honey? I suspect we would not all agree, and that not everyone would be comfortable eating bugs; but that, in my view, is not the point. Perhaps we can begin to modify the cultural narratives and foods we use to define ourselves. The point is to begin to understand ourselves, and the world we inhabit, in its rich diversity, just a little better. Excerpt adapted from "Eat the Beetles: An Exploration into Our Conflicted Relationship with Insects" by David Waltner-Toews. © 2017 by David Waltner-Toews. Published by ECW Press Ltd. www.ecwpress.com.